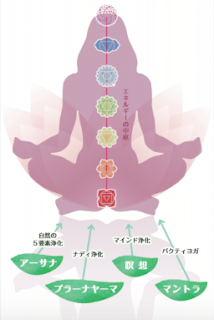 June 24th 2017, we (Yoga Acharya Tej & Anandamayi Aya) offered a Chakra Yoga Workshop in Sivananda Center in Tokyo. Like last time, under Guru's blessing, many people gathered and it was a full house! Workshop started with guided meditation. Then we talked about theory of Chakra. which we tend to easily ignore in the worldly lifestyle. the whole group stranded at their own energy field trying to 'see' how it feels. Practice with awareness brings you to the totally different field that yoga can do for you. all that we practice and deeply study - Asana, pranayama, meditation, anatomy & physiology, yoga philosophy are not separate topics but all one. because mind has its own limit. Today's theme was on the 1st Chakra, releasing fear. Our fear is originated by fear of death. Ancient yogis scientifically revealed how to be free from the fear of death. We have to understand 3 bodies, 5 koshas, Samskaras, and Karma. Thank you so much for the friends and yogis who joined and all the Sivananda Staffs and Director Machiko sensei for the wonderful hospitalities to the sincere yogis to provide such a peaceful learning energy!